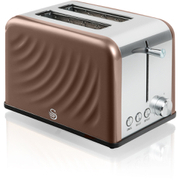 Let's go retro with the chic and stylish 2 Slice Retro Toaster from iconic homewares brand Swan. Featuring a classic design and available in range of five different colours, this great looking appliance will feel at home in any kitchen.It's much, much more than a pretty face though and the stylish cool-touch walls envelop a multitude of functionality including electronic browning control, defrost and reheat options and high-lift feature that makes it easier to remove your freshly toasted food. 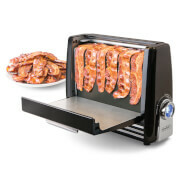 There's even a removable crumb tray to prevent your kitchen surfaces becoming strewn with toasty remnants!